The history and evolution of novel clinical research is interesting. The old ideal, “Don’t think; try is, perhaps rightly tempered by the new ideal of not just the informed and consented patient but protected patient. Such is interesting considering our move, otherwise, away from paternalism. The development of the smallpox vaccine or the first artificial heart would have never happened today as is. Of course, neither would these horrific syphillis experiments hopefully. Not to argue that IRBs and government agencies have made clinical research too burdensome and are hampering progress. It’s just that a focus and regulations beyond guaranteeing informed consent seems counter to the way the rest of medicine is moving. I’m not sure many are arguing three glioblastoma multiforme patients of Drs. Muizelaar and Schrot were at UC-Davis were ill informed. But the treatments they undertook for those patients, without approval, have cost both men their jobs. Dr. Muizelaar was in fact chairman of Neurosurgery at UC Davis prior to this scandal bringing him down. I’ve covered this previously. But with both men resigning earlier this year its worth bringing up again now that we have some resolution. Two UC Davis neurosurgeons who intentionally infected three brain-cancer patients with bowel bacteria have resigned their posts after the university found they had “deliberately circumvented” internal policies, “defied directives” from top leaders and sidestepped federal regulations, according to newly released university documents. Research on humans is tightly controlled in the United States and, according to federal regulations and university policy, must undergo a rigorous approval process to ensure that participants are protected from harm. Innovative treatment, more commonly known as compassionate care, gives a doctor more latitude in offering nonstandard care to a single patient where evidence of safety or success is limited. Muizelaar and Schrot called their novel approach “probiotic intracranial therapy,” or the introduction of live bowel bacteria, Enterobacter aerogenes, directly into their patients’ brains or bone flaps. The doctors theorized that an infection might stimulate the patients’ immune systems and prolong their lives. The first patient lived about 5 1/2 weeks. The second survived another year, an outcome that buoyed the doctors and seemed to bolster their theory, they said. The institutional trouble began in March 2011, when a newly diagnosed third patient developed sepsis, became unresponsive and died two weeks after being deliberately infected. The university’s first internal investigation soon followed. What they did was highly unethical and dangerous. “I think sometimes surgeons and doctors can get caught up in the enthusiasm for what they really believe is going to work,” said Caplan, head of medical ethics at New York University’s Langone Medical Center. “That is exactly why we have FDA oversight and approval and the research ethics requirement we do. Informed consent for novel treatments can be difficult. “Informed” consent for proven standard of care is difficult. But maybe the focus should be on that and not necessarily on impeding access to even highly dangerous and unproven treatments. I am fascinated by the faliability of memory. Especially episodic memory. You and I really don’t remember what we think we remember. It is rarely accurate and yet people are utterly convinced of that their memory is accurate. There are obviously huge implications. Think criminal or civil law. [Dr. Elizabeth] Loftus discovered that she could modify memories with startling ease. After showing a film of a crash, Loftus asked some volunteers if they “saw a broken headlight” and others if they “saw the broken headlight.” Those who got the latter question were twice as likely to say yes – though, in fact, the film showed no broken headlights. Loftus was fascinated, and she soon turned her attention to criminal trials. Suspicious of the accuracy of eyewitness identifications, Loftus conducted an experiment in which volunteers looked at photographs of six faces while listening to a story of a crime. One face was identified as the criminal, five as innocents. Three days later, Loftus showed the volunteers four photographs: one of an innocent character from the crime story, and three of new people. Sixty percent of volunteers identified the innocent character as the perpetrator from the story. They recognized a familiar face but muddled their associations with it. One study in particular bolstered Loftus’ belief that much memory is malleable. In a now-famous experiment, Loftus told a volunteer that she had spoken with his mother and learned four things that happened to him as a 6-year-old. Even odder, the volunteer would usually be happy to elaborate on this implanted memory. His panic, his confusion, his relief; it was all there, hidden away in his memory. Except that it wasn’t—it was all in his imagination. With just a small bit of coaxing, Loftus could insert this memory even into the most skeptical minds. I think this is one of the most fascinating parts of not just cognitive study but all of neuroscience. Functional neurosurgery may hold promises to improve memory, not just in pathology (such as dementia), but in normal individuals. Initial studies show poor episodic improvement, but who knows what the future holds. And I wonder the implications of that for these “false” memories. Often times as neurosurgical residents we’re asked by faculty why we would (or wouldn’t) operate on patients. Therapies for cancer can have different goals. You, hopefully, don’t operate just because a brain tumor is there. Often times, surgery for malignant tumors that cannot be “completely” resected – in which a gross total resection cannot be achieved – has limited influence on cure or survival rates. I’m not a big fan of the idea of cytotoxic reduction. In general then surgery can have any of three goals. It can have an oncological goal – if the tumor can be resected to a degree to influence survival. It can have a palliative goal – if debulking the tumor will relieve symptoms. It can have a diagnostic goal – if getting tissue will identify the tumor so that other treatments can be initiated. Non-invasive therapies, such as chemotherapy or radiation therapy, can similarly have either an oncological or palliative goal. All of these therapies can have significant morbidity and side effects and so the decision to undergo therapies merely as a matter of palliation should not be taken lightly. In many cases you can exchange current symptoms for other symptoms or increased risks associated with therapies. The therapy was only palliative and had no oncologic goals and no hope of improving survival. Its tough to relate these complex ideas to patients when there is such a disparity in information. Often times, in my experience, prognosis is discussed in vague terms. “This is not a curable disease,” or things along those lines without discussion that this is actually going to be fatal or discussion of numbers in terms of survival or what progressive symptoms and quality of life are likely to look like. Difficult discussions no doubt. But without such discussion it seems impossible to fully explain things like palliative therapy. 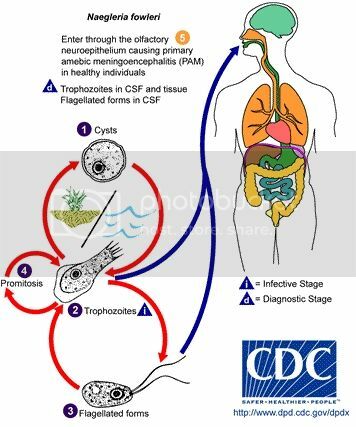 I know its just me but it seems the summer of Naegleria Fowleri, the “brain eating” amoeba, that each year makes headlines in the American south. In short order there have been at least three cases I can think of that have gotten significant media attention. It seems more prevalent in the news than I remember it in previous years. And yet the disease remains as rare as ever. Perhaps its just the coverage of Kali Hardig, the first survivor of the meningoencephalitis caused by the amoeba in decades. I will say she looks remarkably non-devastated neurologically for having gone through this infection. N. Fowleri enters the brain through the nose. It lives in warm, shallow, still, fresh water. The symptoms of its meningitis occur within a week of infection. Rare cases of survival are probably related to early diagnosis. Mainstay treatments are highly ineffective but center on amphotericin B plus or minus steroids. The CDC is handing out miltefosine this summer as a new possible treatment for amoebic meningoencephalitis. But all three of the cases I know about got it and two of them didn’t survive. Not a massive shift in prognosis but considering where we’re starting from any other therapy options are probably welcomed. Luckily this remains an incredibly rare disease. Bevacizumab is an anti-VEGF antibody used as a chemotheraputic agent. VEGF is a growth factor in the body that promotes the growth of new blood vessels. The antibody is marketed as Avastin and has on-label approval in a number of cancers. Initially approved for colon cancer it is now used in lung and renal and, for our purposes in this post, glioblastoma multiforme. GBM is an aggressive primary brain tumor. It is what Ted Kennedy passed from. Avastin got quick approval for GBM from the FDA based on limited studies and results that showed it delayed progression once patients had progressed on traditional chemotherapy. Well now at the American Society for Clinical Oncology meeting two phase III randomized studies have shown somewhat disappointing results for Avastin in terms of prolonging overall survival in patients with GBM. Both the Radiation Therapy Oncology Group protocol and the AV Aglio trial put Avastin with Temodar and radiation therapy at diagnosis to see if such improved survival versus simply temodar and radiation, a more traditional therapy. Perhaps no surprise as phase II trials had shown similiar prior to these two large trials but there was no improvement in overall survival. Avastin didn’t prolong life when used as a first treatment for people with brain tumors like the one U.S. Sen. Edward Kennedy died of several years ago, two studies found. In one, patients who were expected to benefit the most from Avastin based on genetic testing had the worst survival rates. Side effects also were more common with Avastin. That might not be so horrible, since Avastin’s current approval is essentially as salvage, but the side effects were much more significant when Avastin was added to Temodar as a first line agent. Avastin used to have approval for use in breast cancer but something very simliar had to the data with Avastin in breast cancer that prompted the FDA to pull approval. Avastin received Food and Drug Administration approval after studies suggested it delayed disease progression. But when later research showed it didn’t prolong life and brought more side effects, its approval for breast cancer was revoked. I would argue, and clinicians more in the know than myself however are already as well, that progression free survival in brain tumors is something different than progression free survival in breast cancer patients. [B]ecause of the cramped quarters of the brain, progressive disease almost always has immediate effects on cognitive and motor functions. Other studies have shown that patients receiving Avastin are more likely to be able to live independently, and have less need for corticosteroid drugs. If Avastin does indeed produce very quantifiable quality of life benefits, potentially mostly in terms of preserved cognition and functional ability, then it would obviously be a potentially well worth therapy, at least as continued second line therapy, even with its known potential side effects. It is common practice in some techniques for putting in deep brain stimulator electrodes to keep patient’s awake to make sure the electrode is in the right place and giving good symptom relief. Likewise for parts of some surgeries for brain tumors you might have a patient awake to “map” their brain surrounding the tumor so as to not damage important parts that control things like movements or speech. You may ask patients to do certain tasks while they’re awake so that you can see if the stimulation is working or see if an area of the brain is involved in such a task. I don’t think I’ve ever heard of anyone playing the guitar during a surgery however. Does It Matter Where You Die? Injury to the brain continues to be a unique thing in medicine. These injuries are scary and unfamiliar to many health care providers. There is a finality to them. Their consequences are hidden a little bit; the asystole is easy to figure in the emergency room but the suppression and brain death isn’t something so easily recognized. They’re what you might imagine, along with polytrauma, as poster child conditions for tertiarization and transfer to a higher level of care. In truly catastrophic injury to the brain however, I’m not sure that’s a good thing. My institution has had a small discussion lately on just what ethics and the law requires of us as a place with full neuro specialty coverage. A 61 year old man comes into a small community hospital’s emergency room. He was found down at home by his wife and last seen normal four hours previously. He wouldn’t wake up and he was breathing slowly and shallowly. The ambulance crew intubated him. In the emergency room his pupils are large and don’t react to light and he doesn’t do anything when the doctor hurts him. He’s in a very deep coma. If the physician working the emergency room felt comfortable doing a brain death exam, which he doesn’t, the patient might have some very primitive reflexes left but his condition is very serious. 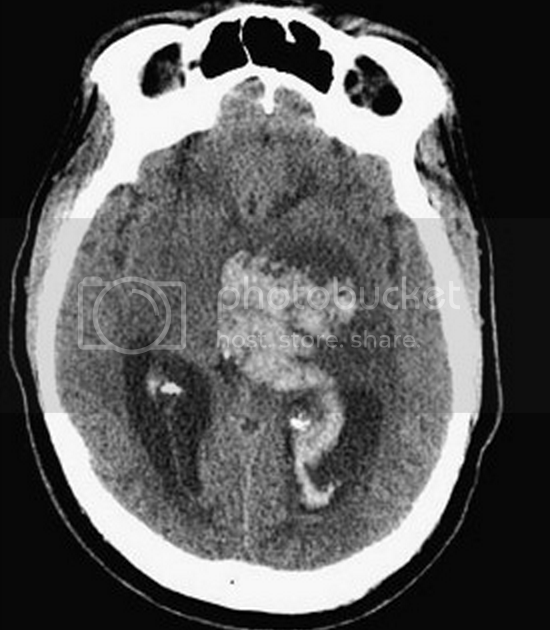 A CT scan of the head is performed and shows a large bleed within the brain. The bleed was probably caused by high blood pressure. In reality however, the patient’s condition is essentially terminal and the cause of the bleed isn’t important at this point. The small hospital has an intensive care unit and an open bed. It however has no neurosurgeons, nor indeed even neurologists who round at the hospital. And so the physician in the emergency room starts trying to transfer the patient to a hospital where a neurosurgeon can see the patient. not refuse to accept an appropriate transfer of an individual who requires such specialized capabilities or facilities if the hospital has the capacity to treat the individual. Case law on the non-discrimination provision is scarce but in catastrophic injury, where no specialized intervention will alter the course of the patient’s condition, I would argue that the patient doesn’t require specialized care. And not merely cases where the patient is brain dead at the time of the transfer request but also in situations where brain death is inevitable or the condition is otherwise not survivable. The patient and family can proceed to comfort measures at any hospital, there is no specialization about such care. The second issue is an ethical one. Do hospitals with specialized capabilities owe something to patients and families to transfer as a matter of finality and closure. In that we’re saying, “Watch, we did everything we could…”? While I’m somewhat empathetic to such an argument I have trouble with it. I think it reflects a problem in both the expectations we have of health care as patients and how physicians are trained to deal with end of life. Really it is a shame for physicians to come out of training without basic palliative and communication skills. Even the physician in the small rural emergency room should have such a skill set. The capability to have an end of life discussion with families, even if the medical issue falls somewhat outside their scope of specialty. I’m also somewhat disappointed in how some referring physicians appear to place priority in getting the patient off their hands over the patient’s well being. I’ve had cases where even after discussion with the consulting physician at an outside hospital and having seen the films and described in no uncertain terms to the other doc that the injury is not survivable that they continue to press for transfer. I may be wearing blinders here but, and I think much of this is subconscious, I can only draw a single conclusion from such arguing. The continued pressure to accept the patient in transfer, after I’ve explained there is nothing to do for them, is a condemnation of my analysis of the situation. They’re basically calling into question my competency; my faculty’s compentency. And I’m okay with that in the sense that I’m not going to take offense. What I have trouble with is they’re now trying to transfer their patient to a consultant who they don’t think is competent. I don’t know how they can have the patient’s best interests in mind and work to transfer them to another physician they’ve basically said they don’t trust. The issue gets more complex of course and I could continue writing. What if the patient was 6 months old instead of 61 years but the situation, in terms of the finality of the condition, remained the same? How many physicians on the line at the accepting hospital are literally too lazy to accept the transfer and work for any reason not to? In general however, in an honest physician-to-physician phone call, with terminal conditions, where nothing will be done at the accepting hospital, no matter the patient’s age, I’m not sure transfer is a good thing. It significantly contributes to costs, provides false hope and contributes to our societal expectations at the end of life. Unfortunately sometimes in neurosurgery when you do a surgery you have to leave the part of the skull you remove to access the brain off. The most common situation is in neurotrauma. A patient has had an extensive injury and perhaps there scalp has been opened and the underlying skull is exposed to the outside and poses a real infection risk. Or their skull has been fractured so badly that it can’t cosmetically be put back together very well. Or they have their skull put back on after surgery but it gets infected and then the infected piece of bone has to be removed and can’t be used again. In these cases we sometimes use custom made implants which are built by biomedical firms off of a special CT scan. They are pretty amazing and can give great results. They’re also expensive and to be honest I’m not one hundred percent sure how they’re made. But it comes as no surprise to me that the rise of commercial 3D printing might disrupt the, admittedly small, market for such cranioplasty implants and substantially lower costs. Now replacing large portions of people’s skulls is not necessarily new. Back in 1997, Science Daily reported on advances in implants that involved using CT and MRI scans to create a model of the skull and then have a special implant manufactured from medical-grade plastic. What’s different about the 3D printed approach is that implants are lower cost and can be customized to specifically fit the patient. Additionally, if the implant doesn’t quite work out, replacements are readily available. Other implants are coming, I would imagine. It is likely to be pretty impressive technology.